The ordinarily tame nutty flavor found in the assortment of nuts in this mixture is transformed in a wild, crazy manner in this Crazy Cajun trail mix. Slightly crunchy pepitas and light, crispy guacamole strips don’t escape the sprinkling of spices that adds excitement, intensity and heat to this mixture that’s sure to provide a jolt to your taste buds. Spicy Peanuts, Almonds Roasted Salted, Pepitas Roasted Salted, Corn Nuts Roasted Salted, Chili Lemon Sticks, Hot Cajun Sticks, Guacamole Bits. Yummy, my customers love this mix and I like that it is spicy but not too spicy. Guacamole sticks are my favorite really adds a nice touch. The right amount of spicy-hot. I really like the flavor. (I’ve had some other Cajun mixes, but the flavors “mix the mark” a bit, for me, but this one is right-on.) Crunchy! I love the crunch! Just the right amount of spicy without being too salty like some other Cajun mixes I’ve tried. The bag didn’t last long, the perfect snack that is perfect while watching a ball game. The best mix so far love the Guacamole strips. Best cajun mix. My customers love it. These are a FAV! I mix with the Guacamole and mixed nut, EVERYONE loves this mix! Crunchy, with just the right amount of heat and salt make this mix a winner. Only one problem: I had to pace myself!!!! 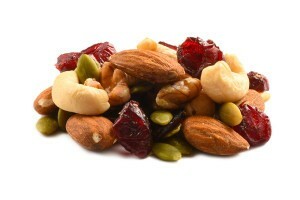 Crazy Cajun Trail Mix is an office favorite! Spicy but not too spicy. Very flavorful and colorful to look at as well. This trail mix is the BOMB! Great snack for watching TV. This is loaded with flavor and tasty. I am not a huge lover of snack mix but this one is great. This Crazy Cajun Trail Mix is absolutely fantastic! Very tasty without being overly salty. Can’t stop Very good, can’t stop eating this trail mix.